UPDATE for December 2018! We’re excited to announce the general availability of the Business Critical tier in Azure SQL Database Managed Instance. Business Critical is built for applications with the highest IO requirements and offers the best resilience to failures using several isolated Always On replicas.To learn more, see our announcement. We are excited to announce the upcoming general availability (GA) of the General Purpose service tier in Azure SQL Database Managed Instance on October 1, 2018! 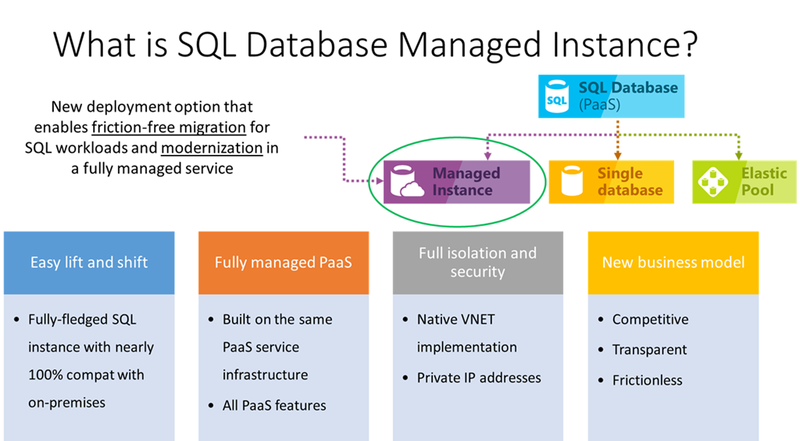 Managed Instance is a new resource type in SQL Database that streamlines the migration of SQL Server workloads and combines the best of SQL Server with all the benefits of a fully managed database service. The General Purpose service tier is designed to be the optimal destination in the cloud for the majority of business applications that have typical performance and IO latency requirements. “A big challenge with migrating was that we have 8 TB of data in production, and there wasn’t any other SQL PaaS offering available supporting more than 8 TB. We knew that we would have to move the solution and monitoring in-house. We used SQL Database Managed Instance, a way to migrate huge databases into Azure cloud without changing any code and stay compliant with all the applications so we can make a one-to-one transfer. Before the migration, our biggest concern was performance. We have a lot of users and the performance surprisingly did not get worse; it is performing just as well. On top of this, we also have the security of always running on the latest software version. Azure SQL Database is a fully-managed database service, which means that Microsoft operates SQL Server for you and ensures its availability and performance. You can deploy and resize Managed Instances at the scale that your business requires. Rich compute and storage options, ranging from 8 to 80 vCores and 32 GB to 8 TB, allow you to start small and scale up seamlessly without impacting app performance to accommodate the demands of the biggest workloads you have. Managed Instance also includes innovative features that can enhance your security and business continuity to levels you’ve never experienced before. For example, you can rely on built-in high availability (HA), automated backups, and point-in-time restore to ensure business continuity. With a comprehensive security portfolio, you can turn on Intelligent Protection features like Threat Detection which acts like an alarm system over your database, providing you proactive alerts about potential malicious activities. Imagine virtually hands-free administration for hundreds to thousands of your SQL Server databases! Easy migration without code rewrite and the benefits of a fully-managed database service make Managed Instance the most economical destination for your applications in the cloud. According to Forrester Consulting’s Total Economic ImpactTM study, Managed Instance provides a 3-Year ROI of 212 percent, CAPEX savings from avoided hardware, storage and networking costs of up to $800k/per year, and productivity gains of up to 40 percent for in-house database administrators and 20 percent improved productivity for IT teams1. In addition to the benefits of a fully-managed service, Managed Instance enables an instance-scoped programming model that provides high compatibility with on-premises SQL Server (2005 through current versions), reducing or eliminating the need to re-architect applications or manage those databases after they are in the cloud. This instance scoped model includes features such as native database restore, user-initiated backup, SQL Agent, Database Mail, Service Broker, Common Language Runtime (CLR), Change Data Capture, logins and instance-scoped SQL Audit, catalog views, and DMVs. For a comprehensive capability overview of Managed Instance, check out our public preview announcement and documentation landing page. Managed Instance GA is coming with a lot of exciting new capabilities that will improve your experience, including instance deployment improvements through database migration, security configuration, and continuous health and performance monitoring. This important milestone also introduces a 99.99% availability SLA, a richer set of programming features, and industry leading security and compliance. First, we expanded the list of available regions by including Japan West, France Central, and UK West and reduced the average provisioning time in all available regions to a few hours for the first instance. In order to simplify the networking setup, we have created ARM templates and enabled options on the Azure portal to check compatibility of your existing VNets and subnets, or to provision new “SQL Managed Instance compliant” VNet in one click. To get started quickly, you can also deploy Managed Instance and a client virtual machine with preinstalled SQL Server Management Studio (SSMS) by clicking the Deploy to Azure button on the ARM Quickstart Templates page. With the GA release, you can set network security groups (NSG) on the subnet where Managed Instance is deployed to enable networking isolation with restrictive traffic filtering. Additionally, you can use the SQL Vulnerability Assessment service that discovers, tracks, and helps you remediate potential database vulnerabilities. Both capabilities will ensure optimal security and help you stay compliant with your policies after you migrate to Azure. The GA release also significantly enriches database migrations. You can use the Azure Database Migration Service to migrate the databases from an on-premises SQL Server instance to an Azure SQL Database Managed Instance with minimal downtime, enabling a seamless application switch to Azure without impacting your business. In order to ensure the best possible performance after migration, you can now use the integrated cloud monitoring solution, Azure SQL Analytics, to analyze query execution stats, waits, and errors in your managed instances. Moreover, you can leverage Intelligent Insights, a built-in capability which automatically identifies and alerts on performance degradations, to dramatically reduce time spent on managing and tuning your instances and databases. Finally, we’ve continued to add the SQL features you’ve used and loved for years — in the cloud, too. You can now use transactional replication in different scenarios where data replication and synchronization are needed between SQL instances hosted on-premises and Managed Instance, in both directions, and between multiple Managed Instances. Transactional replication allows you to replicate data continuously in hybrid environments, synchronize data replicas for reporting, or move data back on-premises if your compliance policy requires you to do so. Try Managed Instance General Purpose today and let us know what you think! To quickly get started, visit our documentation home page and use the 5-Minute Quickstarts to easily configure Azure network for Managed Instance. Create or scale Managed Instance from the portal, PowerShell, Azure command line, and ARM templates. Alternatively, if your workload demands optimal performance, deploy the Business Critical service tier (currently in preview, providing full production support). Note that in addition to premium IO performance and high availability, Business Critical also offers additional features such as in-memory OLTP and one additional read-only replica (Read Scale-Out). For more details on user scenarios and a list of features and capabilities, visit the Managed Instance documentation page. 1 Data based on interviewed customers.